Chink Martin (real name Martin Abraham) was born in New Orleans on June 10, 1889, he took up string bass and tuba at an early age. Originally a guitarist, Chink switched to violin and mandolin before choosing the tuba and string bass as his instruments. He is the father of string bassist Martin ‘Little Chink’ Abraham, Jr., and brother of Willie Abraham a famous New Orleans banjo, guitar and bass player. Chink started playing tuba with the Reliance Band and Jack Laine around 1910, He began doubling on string bass and played with many bands in New Orleans before joining the New Orleans Rhythm Kings in 1923 in Chicago. Martin returned to New Orleans in 1924 and worked with John Bayersdorffer and Freddie Newman before joining the reformed New Orleans Rhythm Kings in New Orleans in 1925. 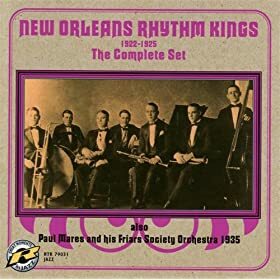 He also worked regularly with the New Orleans Harmony Kings under drummer Tom Earley and later with the New Orleans Swing Kings. He continued to free lance with various bands and later became a staff musician at WSMB and (in) New Orleans in the 1940’s and 1950’s. During the late ‘50’s into the 60’s he remained very active in New Orleans jazz joining up with the likes of local legends Pete Fountain, and Al Hirt. and the Crawford-Ferguson Night Owls. All About Jazz musician pages are maintained by musicians, publicists and trusted members like you. Interested? Tell us why you would like to improve the Chink Martin musician page.